The cure is in the kitchen. Steaming hot bowls of "stinking rose" soup will fortify your immune system and keep illness away. Who said medicine has to taste bad? The Greeks, Egyptians and Romans effectively used garlic to treat a host of ailments including infections, digestive problems and high blood pressure. Most don't know that garlic was the favored treatment for tuberculosis prior to the introduction of antibiotics during World War II. 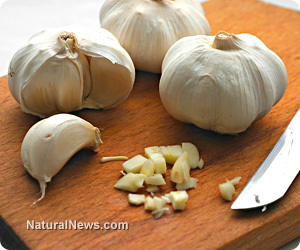 In 2012, the International Herald Tribune [now the International New York Times] ran an article titled "Garlic inhibits TB bacteria, finds research." The article stated: "Garlic is already known for its anti-tumour, anti-hyperlidemic (lowering abnormally elevated lipid levels) and anti-microbial properties." Allicin is the compound in garlic that gives it its pungent odor as well as its powerful health benefits. A mere 1 milligram of allicin is nearly 15 times as potent as penicillin. Allicin offers a broad spectrum of protection against pathogenic bacteria, viruses and parasites. It even kills MRSA and is effective against yeast infections. Garlic contains 33 active sulfur-containing substances. When ingested, allicin converts to sulfenic acid, which is the fastest acting free radical eliminator, bar none. Savvy health experts increasingly promote eating whole foods as a foundation for good health and healing rather than taking supplements, especially when it comes to garlic. Eating garlic is by far the best way to ensure that you receive its numerous health benefits. The "proper" way to eat garlic for health purposes is to first smash a whole, fresh clove with a garlic press, or chop it with a knife or smash it with the back of a knife. Then wait about 5 minutes before consuming. This ritual ensures that the potent, medicinal allicin in garlic has been activated. So if you buy powdered or jarred garlic, you will not experience the full spectrum of medicinal benefits that garlic offers. However, there are two other schools of thought regarding the best way to prepare garlic for health purposes. Argentinian researchers discovered that garlic releases allicin when you bake the cloves, while scientists at South Carolina Medical University advised peeling garlic and letting it sit uncovered for 15 minutes if you want to release garlic's full medicinal potential. Preheat oven to 350°F. Place 26 garlic cloves in small glass baking dish. Add 2 tablespoons olive oil, then sprinkle with sea salt and toss till coated. Cover baking dish tightly with foil and bake until garlic is golden brown and tender, about 45 minutes. Cool. Squeeze garlic between fingertips to release cloves. Transfer cloves to small bowl. Melt butter in heavy, large saucepan over medium-high heat. Add onions, thyme, ginger, turmeric and cayenne powder and cook until onions are translucent, about 6 minutes. Smash 12 raw garlic cloves and set aside. Add roasted garlic and 14 raw garlic cloves and cook 3 minutes. Add vegetable broth; cover and simmer until garlic is very tender, about 20 minutes. Working in batches, puree soup in blender until smooth. Return soup to saucepan; add almond or other milk and bring to simmer. Add 12 smashed garlic cloves to finished soup and stir. Season with sea salt and pepper for flavor. Squeeze juice of 1 lemon wedge (into each bowl) and serve.